As I have done my early research on the history of medical care in the Christian west, I have benefitted greatly from (and blogged extensively on) the work of Guenther Risse and Darrel Amundson (if you chuck those names into the search box at the upper right of this blog, you can see a number of posts of material from those scholars). But I have still been left with questions unanswered about the theological underpinnings of Christian medical care. Didn’t early/medieval understandings of human dignity, rooted in a scriptural insistence that we bear the “image of God,” join the Matthean sheep-and-goats passage to set the table for a Christian imperative that all should serve the sick, the dying, the poor? I was looking for a smoking gun on those things in the secondary literature. Well, now I’ve found it. It’s the wonderful and relatively new (2009) book by an Amundson colleague and collaborator, Gary B. Ferngren. The book is called Medicine & Health Care in Early Christianity. 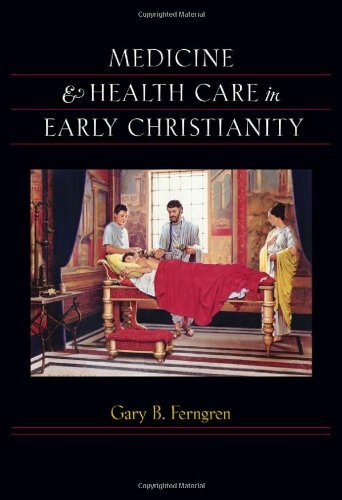 Though it is not medieval in its scope, I have no doubt that the rich theological rationales for an “imperative of care” that Ferngen discovers in the early church continued to be influential if not determinative right through the early modern period and beyond. This early tradition of Christian health care is, like so much else in modern western Christianity, our forgotten heritage. I’d love to launch a mini-conference at Bethel University, whose nursing department is one of the best in the Midwest, using some of this material and talking about “the Christian imperative of care” or something like that. If you are familiar with the work of Rodney Stark, who provided the single, prominent blurb on the back jacket of this Johns Hopkins U Press book, then you know Stark makes this same argument in his The Rise of Christianity: A Sociologist Reconsiders the Evidence. It was in Stark that I first encountered this idea of Christianity as a healing religion and healing as a determining factor in Christianity’s early spread. Miraculous healing or “ordinary” healing? There is much more, and I am just beginning to read the book. I look forward to learning, and sharing, more of Ferngren’s work. This entry was posted in Uncategorized and tagged Early Christianity, health, hospitals, medicine, Rodney Stark. Bookmark the permalink. This post jogged me to write about the Beatitudes and healing. Some of it is below, and I’ve left a link for anyone who cares to read further. 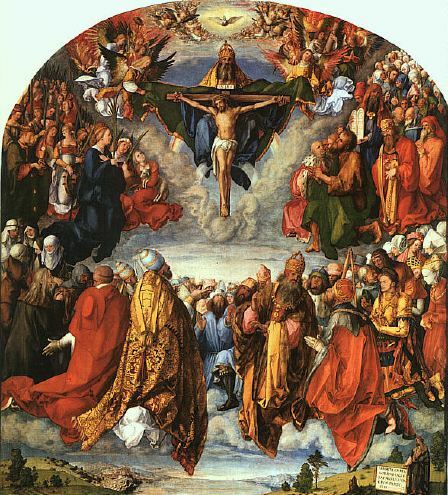 One more note on Christianity as a healing religion: wasn’t it the Council of Trent that solidified Church teachings on the annointing of the sick/extreme unction? The teaching would have come from James. 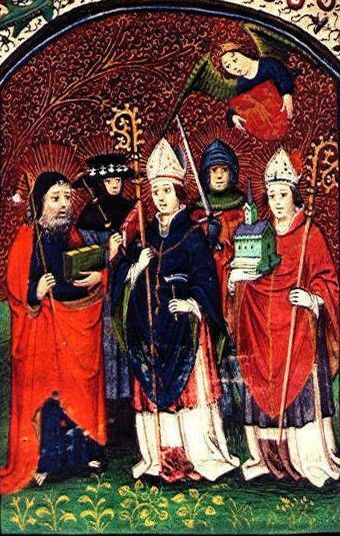 Close proximity between the dying and their clergy would have been critical during the plagues. Christ went up on the mountain to heal the multitudes. The topic of healing would have been appropriate on this occasion. The beatitudes are eight in number, suggesting healing to the ancient and medieval mind. In the Hebrew tradition, Beatitude, or blessing, carries the meaning of “to verbally call into existence the power for something to be what it was intended to be.” In this sense, blessing is parallel to healing. Hippocrates lived 400 years before Christ and his ideas about healing had spread throughout the ancient world by the time Christ taught the Beatitudes. His ideas were practiced by Greeks and Hebrews alike. In the ancient world, healing was approached through a balance of the four humors; four fluids which led to the process of correct digestion of food within the body. With exception of traumatic injury or an affliction from birth, all disease was said to originate from an imbalance of the humours. With four humours, there are eight ways to be unbalanced: therefore, eight beatitudes. Hippocrates’ famous aphorism diffuses responsibility for the healing process from the doctor to the patient himself, his attendants, and his environment. It does not excuse the doctor, but it does point to the ways we can help ourselves and others heal. The Beatitudes follow this same general structure; starting with balance within the individual, moving us to provide balance to others who are afflicted, urging us to create a balanced environment that leads to healing for all; and in the last resort, in the face of hostility, trauma, and even death, offering the ultimate remedy of resurrection. Among the key Koine Greek terms used in the Beatitudes, nearly all have an application to disease, recovery from disease, and affliction. In the final beatidue I can find no reference to healing, except the promise of the Kingdom of Heaven, and the ultimate healing offered there. In addition, Christ lays out his list in a culturally familiar way. From the first beatitude to the last, he follows the order of the Tripartate Soul established by Plato in Timeaus. Leading the list, spirit is associated with the head. Mid-list, hunger is associated with the belly. Nearing the end of the list, cleansing applies to the lower organs. I beleieve when he gave the Beatitudes, Christ may have relied on culturally shared ideas about healing like the ones mentioned in order to stimulate his audience to consider the value of spiritual healing, which has both immediate and eternal value. Although the eighth Beatitude does not seem to touch on healing in a direct sense, I love the imagery when I look at the Greek: Jesus urges those who are being pursued, driven, who are fleeing because of persecution for righteousness to be glad, to take a flying leap (paraphrase mine!) right up to the sky where they belong (translated “theirs is the kingdom of heaven”). He goes on in the next verse to make light of those who “talk down” to the citizens of the sky. The definition of blessing I gratefully ascribe to Dr. Stephen Hooks. These opinions are all my own. I have been a student of ancient medicine for more than ten years, without anything to show for it except a greater appreciation of how medicine was viewed in ancient and medieval cultures. I do not practice any form of medicine. *I’m not saying Jesus told his audience to worship Eirene; he told them that by making peace, they themselves would be called “children of God,” making such a goddess/guardian of the heavens obsolete. I’ll have to look for this book. I wonder whether this author, or someone else out there has approached the Beatitudes as a prescription to heal our spirits? First, “blessing” is a lost concept, I think. Dr. Stephen Hooks, Rich Mullins’ and my favorite professor at CBC, defined it as “To call (verbally) into being the power for something to become what it is intended to be.” He was studying for his doctorate at Hebrew Union at the time. His definition sounds a lot like healing to me. Next, the context. Jesus went to the mountain to heal the multitudes. Third, the details: The number eight signifies healing in the ancient world. it remarks the four kinds of humoral imbalances: too much or not enough of each. For clarity, the four humours are better described in terms of the four virtues. Something to consider, perhaps. I think youa nd I ar emoving on the same lines here, myself as prist and herbalist. How great a heresy were the ‘witch hunts’ of the inquisition years that attempted to wipe out the indigenous healers? If I knew more about the indigenous healers, I could better answer your question, but it doesn’t look on the face of it like this would be a “heresy”–which is a problem of belief. Rather, perhaps, a very poor Christian practice involving violence.